The Nexus 5X is becoming a downright good deal lately with all the price cuts. 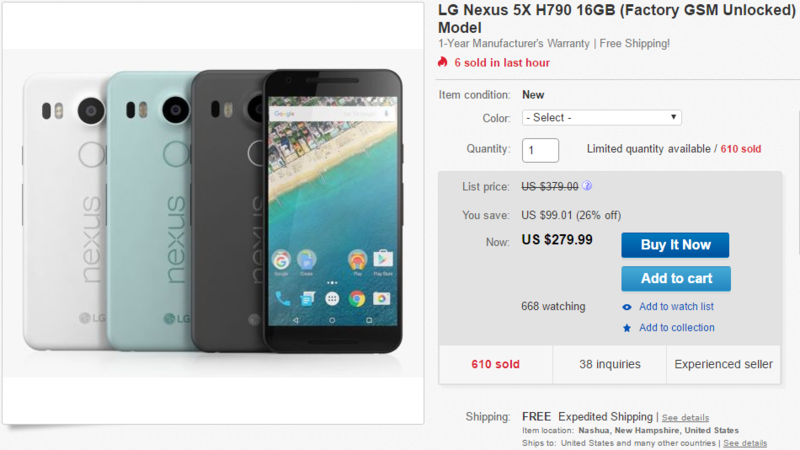 Google is selling the phone for $300 right now, but you can get one even cheaper on eBay today. The 16GB Nexus 5X is going for $279.99, a $20 discount from the Play Store. The 32GB variant isn't part of this sale (there's an okay deal for $10 off that version), so you're going to be working with a mere 10GB or so of free space when you get the phone. For some people, that might be fine considering the price. The blue version is sold out as well, so it's just black or white. As usual, you get free shipping on US orders, but the seller will also ship internationally if you're willing to pay for it. The seller is in New Hampshire, so there's no sales tax for anyone.